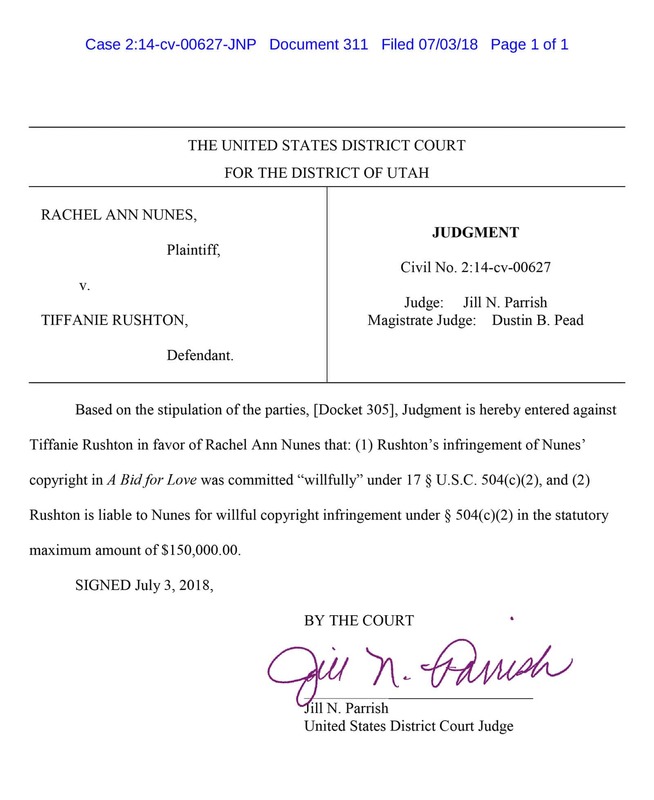 I’m happy to announce that the final chapter in my copyright infringement case against Tiffany Rushton has been written. Three years and eleven months ago, I learned Rushton had used the pen name Sam Taylor Mullins to plagiarize one of my books, and she subsequently threatened and harassed me when I fought for my rights. In March 2018 after numerous delays and shenanigans pulled by the defense, the judge ruled in summary judgment that Rushton had infringed on my copyright, and with a little over a week left before a trial on willfulness and damages, the case was settled. Below you will find the official document where Rushton admits willfulness and accepts liability to the statutory maximum of the law. You can find Rushton’s public apology here. While all the funds paid in the plagiarism settlement go to my attorney Shawn P. Bailey for nearly four years of diligent work with very little reimbursement, I feel this is a huge win for me, authors, and copyright. Shawn put in over 225,000 worth of hours into the case, and while the settlement and the earnings on the GoFundMe won’t recoup those lost hours, he is grateful to have been a part of bringing a plagiarist to justice. No, he won’t be charging me the difference! However, now that the gag orders have also been vacated on the case, it is sobering to tell you that my book and Chase Weston’s real live combat story were not the only stories taken by Rushton. At least two other authors were also plagiarized in Rushton’s earlier books. The infringement began with scenes and chapters until finally she stole my entire book. This shows a pattern that I think is pretty common among plagiarists. Unfortunately, the cost of prosecuting, and the slimy tactics some attorneys will go to in an attempt to free an obviously guilty client means that too many offenses will go unpunished. So we have to look out for each other, because copyright infringement law is next to useless if you aren’t rich. I am grateful for the support of the reading and writing community. For the authors who understand what it means to have a book stolen. Who donated and commented and told me I wasn’t alone and that I represented them as well as myself. 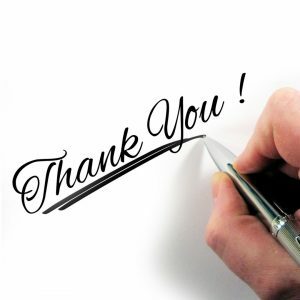 For the readers who also offered encouragement, donated funds so that my attorney could cover expenses, and purchased my books so I could pay my bills. I could never have come this far without all of you! Click here for a PDF of the final ruling, but I’ve put the jpeg of it below. As I said above, I’m relieved that it’s over, and so grateful for the support. But there are lasting consequences. I lost a year of writing, which means three books and the lifetime income from them. I can never get that back. I can never recover the years of incalculable turmoil. When I see strange one-star reviews on my work, I will always wonder if Rushton is up to more tricks. I have also been severely awakened to the knowledge of just how far someone will go to hide their actions. As you can imagine, my trust in people is still not at an all-time high. But I have already forged ahead. I know there are people out there who are generous, loving, and who defend right. I know because these people supported, loved, and helped me during the past four years. I love writing again, and stories are once again shouting in my head, begging me to put them on paper. 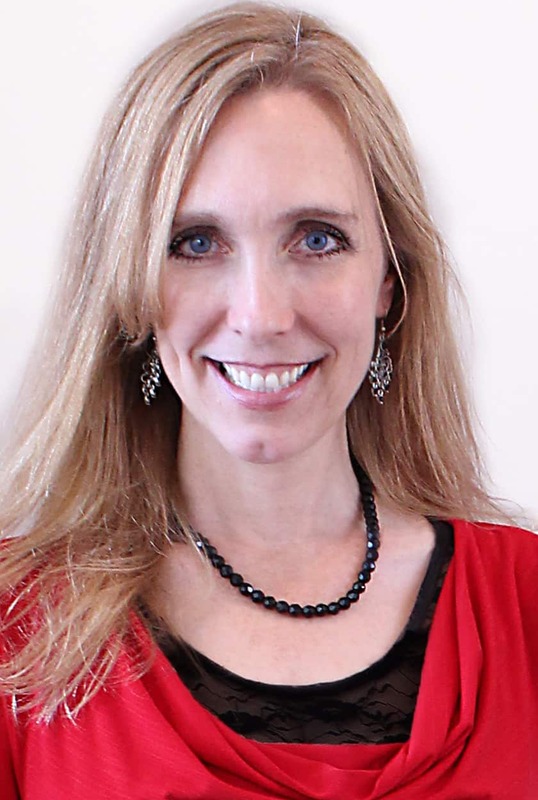 After that first lost year, I have written many more books under my pen name Teyla Rachel Branton and am connecting with tens of thousands of readers all over the globe. (If you hop on over to my new website, I have free books available for people who sign up!) Now that I won’t be spending time on court appearance and updates, I’ll have time to write even more books. That’s exciting. I have refocused my energy on my husband and family and being there for them. I have found balance and happiness. 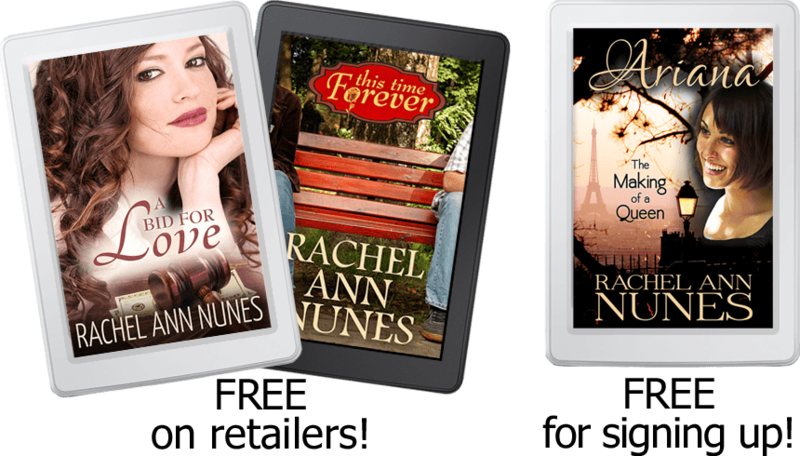 Maybe soon I’ll even write another Rachel Ann Nunes novel. But I’m deep into three different pen name series right now, so don’t look for it too soon! Thanks again for your support. I am eternally grateful. Every time I received your updates, my heart would sink. I’d think: this is still going on? It seemed like such an obvious case of plagiarism. I can’t even imagine the stress this ordeal created for you, Rachel, but I’m so glad that you took on this fight and that justice prevailed! Karen, your support and comments always meant so much. Thank you! Thank you, Rachel for fighting the fight for all writers. So happy it is over for you. I very much appreciate your support! It means more than I can say. I’m so very happy for you that it’s finally behind you! It’s a shame that you won’t get any reparations and didn’t really get a real apology, but I’m just so glad it’s over. That’s exactly how I feel. It is such a relief! I can’t tell you have many prayers I offered on your behalf since this mess began. The brazenness of the attack once Rushton’s plagiarism was exposed baffled me. She acted like you were the bad guy for not wanting to watch her profit from your hard work. Glad that you won, even gladder that is over for you. Thank you Julaine! Brazeness is a perfect word. It baffled me too, as if I should be grateful she stole my book. I am relieved it’s finally over. This is fantastic news, Rachel. I’m so happy for you. Props to your attorney, too. Thank you! I appreciate it! I’ll pass on the word. Rachel, you’ve been a pioneer in this and so many other things! I truly appreciate all the ways your efforts have helped pave the way for me and many others. Thanks, Lee Ann. You know from personal experience how we rise to meet difficult occasions. I am just so glad it’s over! I heard about this case about three years ago, and although I didn’t follow the case I did await an outcome. This is a big win for every person who works hard to be creative. I’ve so glad for you to have been blessed with such a good outcome. Rachel, I’m so glad this is finally resolved and you can put it behind you and move on with your life. I’m so impressed that you saw this to the end despite the cost of time and money. Congratulations and best wishes, my friend! Rachel, are you able to post a link to the court docs for this? At least of the final ruling. I work for a copyright office at a university and we’d potentially like to highlight this case in a blogpost. I don’t have a link to the court site, but here is the PDF the court sent me: https://rachelannnunes.com/app/uploads/2018/07/Nunes-v.-Rushton-Judgment.pdf. Please let me know if you need anything more. 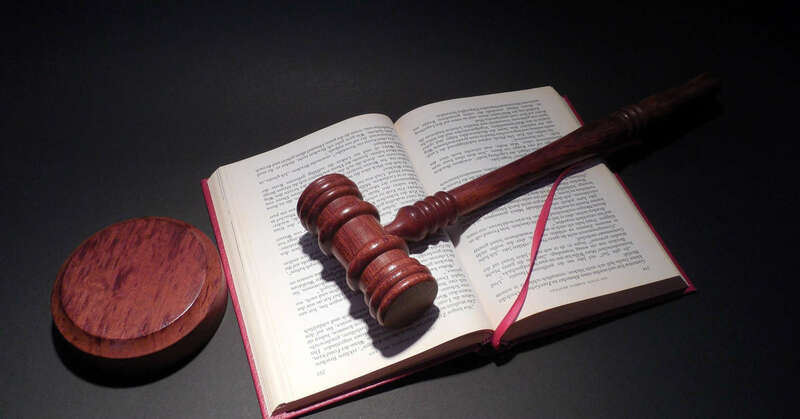 I’ve linked to the complaint and various other judgments throughout the case, but they are scattered on my site because of the very lengthy time for prosecution. Thanks! Thank you! I am actually looking for the fleshed-out “decision” as opposed to the “judgment/ruling.” I’ll try and look for it elsewhere on your site, or we’ll just do a public search of the court documents. Some journalists will post all the docs on an open google drive folder for people to access. If you feel like doing that would be beneficial to you, please let me know! Thanks. I could do that, but if you are looking for the complete settlement agreement, that is not public as far as I am aware because there were protective orders in place. All except one was later vacated, but I think that means the document isn’t public. I’ll ask my attorney. Rachel I am so happy that you can finally put this behind you and move. I used to teach English composition to adolescents. They never seemed to “get” the concept of plagiarism. My hat is off to you for persevering. Do you think she will actually pay? The settlement did require a payment before it was final, so a large chunk has been collected! I am glad she had to make a payment, I just hope you get the rest. Thank you, everyone for your kind comments! It means a lot to me that you posted here.